Sorry Dayton, but your time has run up. Florida is too big, too strong, and have too much pride to lose to a Cinderella. As much of a fan I am of Sibert, I think Florida shuts him down and they dominate. A lot of people are high on Wisconsin, but Arizona didn’t even play that good verse San Diego State and still came out with a victory. I think they shut down the Wisconsin big men, and Zona’s athletic guards cancel at Wisconsin’s good guards. Wisconsin does have a chance in this game, but are going to have to play a perfect game to beat this Arizona team. We'll gladly be your Cinderella, America. These teams had basically the opposite first games. Florida, the heavy favorite, squeaked by a feisty Albany team, and Pitt, a small favorite, absolutely dismantled Colorado. Tough matchup here for Pitt, so don’t go jumping all over them just yet. Albany was a wake up call for Florida, and I see them rolling past a Pitt team that could be a trendy upset pick for some. Dayton with an impressive win (when I was too afraid to take them straight up) is going to give Syracuse all they can handle. They are just as athletic as Syracuse, and have just as much to prove. Dayton is capable of beating Syracuse, but are going to have to shoot it even better than they did verse Ohio State. 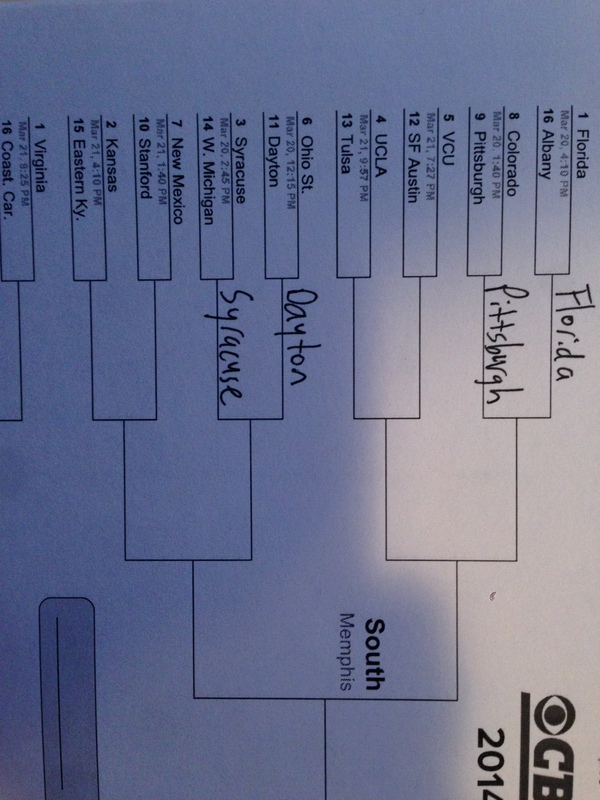 Really want to pick Dayton here, but rolling with the Cuse. After an impressive win verse Cincy, Harvard has the unfortunate draw of playing Michigan State. The Spartans are on a mission, and played unbelievable against Delaware. If Adreian Payne plays half as good as he did yesterday (which would still be pretty dang good) Sparty should roll onto the Sweet 16. 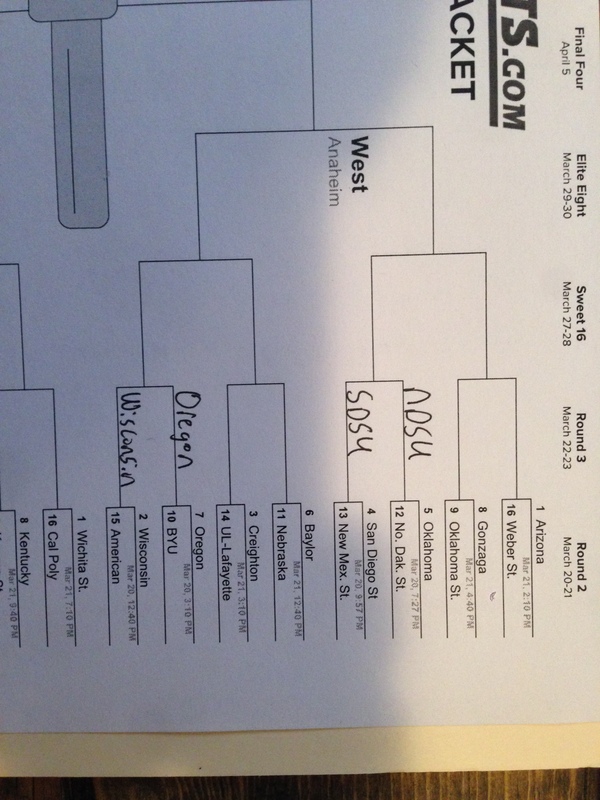 This is going to be a trendy upset pick as a lot of people will have the Wildcats going down to the Huskies. Connecticut barely squeaked by a tough St. Joe’s team, and will be interesting to see how they play against Villanova. Would not surprise me to see the Wildcats winning here, but I am sticking to my guns and rolling with them to the Sweet 16. 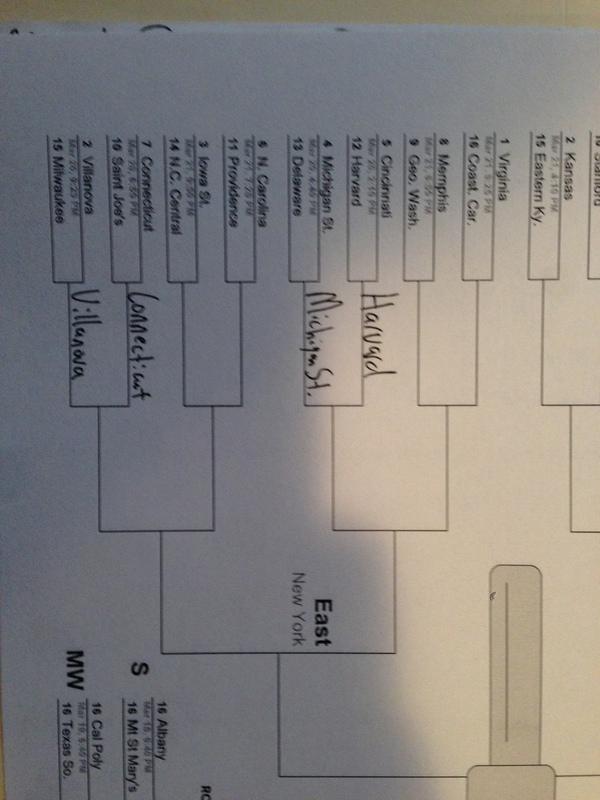 Well I should’ve gone with my gut in the first round with the Bison, and they of course proved me wrong. They beat a solid Oklahoma team who some had going to the Sweet 16. San Diego State beat a tough and big New Mexico State team that was a brutal game. San Diego State is one of the best defensive teams in the nation, but I think North Dakota State finds a way to beat them, and make it into the Sweet 16. I feel like Wisconsin is in this position every year. They beat a team in the first round that they should beat, and then lose the next game. This year could be different, but Oregon will be an extremley tough matchup. It would not surprise me to see the Ducks win, but they are one of the streakiest teams in the tournament, and I am hoping that with Wisconsin’s tough defense they can pull it out. After an epic choke by N.C. State, Saint Louis somehow came back and won that game, and now have to play against Louisville, who also struggled against a Manhattan team that was a mirror image of them. 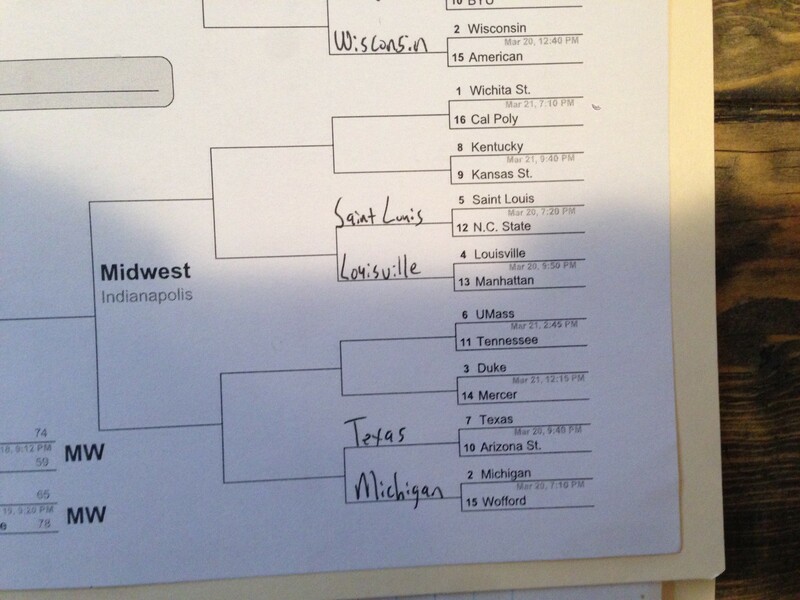 I will bet against Saint Louis all day, so rolling with Louisville here. I think Louisville comes back focused, and will wear down Saint Louis. Jordair Jett will get manhandled by Russ Smith. What a game by the Texas Longhorns to beat Arizona State. Led the whole game, almost choked it away, then Ridley took over and hit the game winning shot. Michigan handled Wofford, and now the two meet in the round of 32. Texas has the rebounding edge and the edge inside, but Michigan has the shooters to force Texas to go away from that. I actually like the Longhorns to control the game, control the clock, and advance to the Sweet 16 (which probably means they won’t).